The initiative is the product of a new report that found more than 1,800 newspapers have been shuttered since 2004 thanks to dropping subscriptions and declining ad revenue, which incidentally has shifted to online platforms, primarily Google and Facebook. To help combat this trend, Facebook’s Journalism Project has introduced the Project Community Network, which aims to get publishers sharing information with each other on “how to create communities and direct relationships with their audiences." Right now, Facebook finds itself in an awkward position. Its Journalism Project is working to ease a problem the platform helped create by driving users to News Feeds to get their news and taking ad revenue from local newspapers. The argument can be made that this is the inevitable result of technological advancement, but clearly, this brave new world brought about in part by Facebook has issues even Facebook can clearly see. That’s why part of Facebook’s goal is to encourage local journalism to help Facebook shake its reputation as a source for misinformation dissemination and to generate content in user News Feeds that help with Facebook’s goal of promoting a more positive platform. That being said, only about half of one percent of Facebook’s revenue is actually dedicated to Facebook’s journalism initiatives, so Facebook’s dedication to this initiative may be more lip service than substance. At this point, however, anything helps. Google used GDC to announce a new live-streaming, gaming service called Stadia that will be hitting devices with Chrome browsers this year. The gaming service will use cloud computing to stream video games to any device with a Chrome browser—tablets, desktops, laptops, phones and TVs. The announcement of Stadia follows an experiment last year called Project Stream, which let gamers play Assassin’s Creed Odyssey over the Internet—no console or high-end gaming PC required. That was in 1080p and at 60 frappes per second, but Stadia will support 4K at 60 frames per second at launch with plans to build that up to 8K and 120 frames per second in the future. Because Stadia is powered by cloud computing, it offers GPU support of 10.7 teraflops. For context the Playstation 4 Pro supports 4.2, and the Xbox One X supports 6.0. Details on latency to date have not been revealed, however. Stadia will launch with a controller of its own but will also support gamers’ existing controller hardware. YouTube gaming will be updated by allowing people watching gameplay to hit a “Play Now” button and immediately start playing a game in around five seconds. There are still plenty of unanswered questions, including an exact launch date, the platform’s launch lineup and how the pricing structure will work. All of that being said, this has the potential to be a big deal. The major gaming platforms, including Xbox and Playstation, have been building up their game streaming capabilities with Microsoft going so far as to say its next console may be cloud based. But Google entering the market with its scale and server support is a giant move even though the market has such entrenched players. Google has some key questions to answer before the true ramifications of this announcement will be known, but initially, it looks big. Instagram is currently beta testing a feature that would let users make, pay for and manage orders all within the Instagram app—no links to a website necessary. The test is currently being conducted with 20 brands, including Warby Parker and Outdoor Voices. Payments will be able to be made through Visa, MasterCard, Discover and PayPal, but payment platforms like Shopify will be able to be integrated in the future. The Instagram storefronts certainly move people from wanting to buying more seamlessly on the platform since users won’t need to link to a company website to complete a purchase, but it also means Instagram, and in turn Facebook, collect a lot more purchase data. It also means brands collect less data and potentially lost sales as users add less items to their carts since they aren’t browsing on websites. This seems tailor-made for DTC brands, but those brands also live and die on their customer data. This is a tradeoff many of them will have to consider, especially if users like and then grow used to making purchases on Instagram. If users like the experience and then find a brand doesn’t offer such seamless purchases, they may forgo the purchase altogether just like when users don’t make a purchase if a product they’re looking for isn’t available on Amazon. Snapchat is reportedly working on the launch of a new mobile gaming platform, with a project currently dubbed Project Cognac. Details are expected to be announced at an event on April 4. Getting into gaming would be a logical move for Snapchat, which has already introduced AR games on its platform called Snappables and it invested heavily in the studio behind the popular mobile game “Fruit Ninja." Following last week’s Facebook outage, some advertisers are asking for refunds from the social network as they were unable to manage their ad campaigns on Facebook. Most, however, are waiting until campaign results come in to fully determine what damage, if any, the outage caused. Facebook’s implementing new protocols to prevent housing, employment and credit discrimination in its ad targeting. The move is part of a settlement that requires the protocols in addition to a $5 million fine. The settlement came after civil rights groups found Facebook offering discriminatory ad practices. Now, advertisers will have more limited targeting capabilities when advertising about housing, credit and employment. LinkedIn has added lookalike audiences, audience templates and search data to its targeting capabilities. Lookalike audiences will allow advertisers to target audiences similar to those who are currently connected to a brand in some way. Audience templates are 20 predefined B2B audiences brands can go after, and search uses Microsoft Bing to allow advertisers to target LinkedIn users based on their Bing activity because Bing is oh so popular. Snapchat is now starting to pay some of its influencers in an effort to keep them from defecting to other platforms. Right now, it's supporting creators focusing on building lenses as part of Snapchat’s creators program. It seems like a good move for Snapchat, which does have an edge over other platforms when it comes to AR. It needs a community of influencers to keep lenses on the platform fresh and to evangelize for the platform. During a recent security review, Facebook discovered some user passwords were stored in a readable format, which is against Facebook’s security standards. Facebook revealed the oversight and confirmed the passwords were never visible to users outside the company and mostly included the passwords of Facebook Lite users. It’s good that Facebook found the flaw and disclosed it. What’s not good is the flaw should have been spotted some time ago as parts of the flaw go back as far as 2012. Netflix is testing a version of its video streaming service that is limited to mobile only. That more limited service would cost $3.62 per month. It includes standard definition and only supports streaming on one device at a time. It’s currently being tested in India. Comcast is launching Xfinity Flex to its internet only customers. The service lets users watch 10,000 ad-supported TV shows and movies for an extra $5.00 per month. Flex subscribers receive a box that supports 4K and allows users to add other services like Netflix, HBO and Amazon Prime. 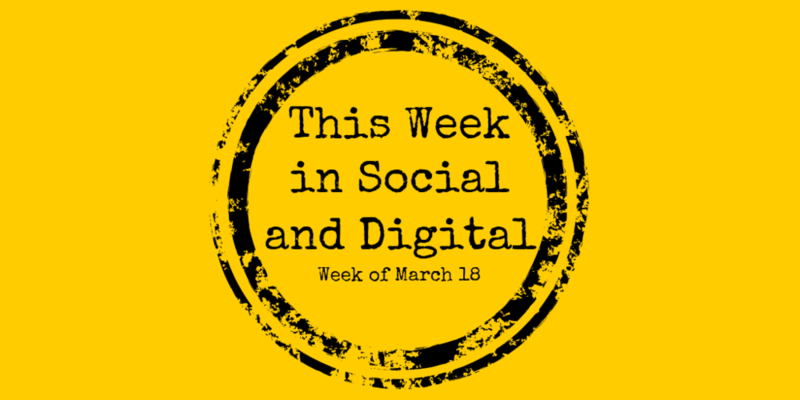 Posted in This Week in Social and tagged with This Week in Social, Digital, Social Media, Marketing, Advertising, News, Facebook Journalism Project, Google, Stadia, Instagram, Snapchat, LinkedIn, Netflix, Comcast. March 24, 2019 by Taylor Wiegert.